I still have to find a comprehensive collection of the works of Marcello Gandini, therefore I decided to open a new series of posts trying to cover all his beautiful creations. The secluded genial designer that arguably gave us the seventies - and the last car design revolution that we care to remember - has never been fit for celebration and even less for giving satisfaction to the press. When asked if between all these cars, there is one that he remembers in particular he said: “I do not have the habit to associate a drawing to the end result obtained. I am not bound to the success of a particular car, rather the memory of the persons that collaborated to the project and the circumstances under which they were created (...) If I think about the Lamborghini Marzal, I think of the night previous to the launch in Geneva; We had only few hours to end the work and at midnight we still had the car dismantled on the floor…. However, we succeeded in time and the following morning left with destination Geneva.Talking about the shockingly groundbreaking Lancia Stratos HF seven years after its presentation at Turin's motor show in 1970 he only ended up commenting: “The very first Stratos was designed as freely as the [Autobianchi] Runabout and reached the aim for which it was intended: to establish a bridge between Lancia and Bertone. Having established the bridge, Lancia asked us to come up with an idea for a new sports car that would go rallying in the world championships.” It sure is the most beautiful "bridge" ever made. But more about the HF when we'll come to it. If you have any kind of familiarity with Turin, you would not be surprised about his attitude. It is a town that keeps things for itself, a town that hates showing off and is almost bothered by publicity. Things have changed much in the last ten years in the heart Turin, since Fiat released its pressure on any kind of development in town. In 1938 Fiat still had to sharp its claws on the town but a faulty royalty allowed fascism to cast its horrid shadow on the Italian peninsula. On the bright side Marcello Gandini was born, just 19 days after another design icon as Giorgetto Giugiaro and 7 months after Leonardo Fioravanti. Must have been something in the water. The little Marcello was born son of an orchestra director, studied music and sculpture and ended up working as interior designer. Apparently had his automotive epiphany when he first saw a Cord 812. He was impressed by the sense of speed and dynamism that those lines still express today. 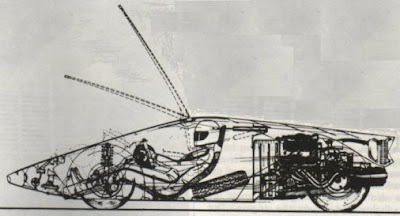 When a friend crashed his Osca asked Marcello to pen a body for it. The young interior designer was asked a full scale drawing for the wooden body buck to be produced and he did so by sticking together on the wall many sheets from the biggest drawing pad he could find. Giovanni Raniero, the man appointed for the wooden structure harshly told him "I can understand nothing!". The young designer didn't know that the standard was to start with the left profile and presented the right instead. 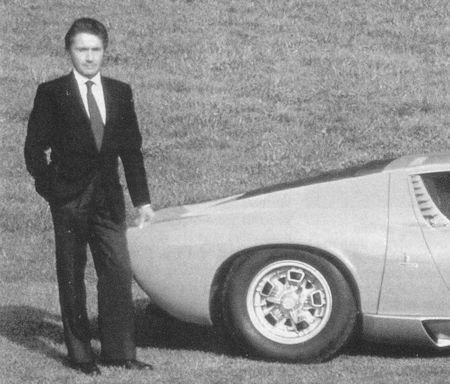 In 1963 he tried to work for Bertone, but the chief designer at the time, Giugiaro, refused to work with him. Thankfully Giorgietto left the company to open his own two years later and Gandini was hired to replace him. He would have worked there for the next 14 years. As soon as he arrived he was asked to complete one of the most important cars of all time and in effect, the first supercar as we know it today. The Lamborghini Miura. The story of this car is one of the most covered in motorsport publications but it will nevertheless deserve a post of its own.